Good lawyers offer clients a swift and successful verdict. Attorney Ken Schwartz of St. Louis, Mo., is accustomed to getting rapid, rewarding results. Not only is he good in the courtroom, he regularly turns on win lights in about eight seconds aboard his immaculate turbo-charged, car-tire Suzuki GS. Lawyer Ken Schwartz, 48, St. Louis, Mo., is accustomed to getting rapid, rewarding results. Not only is he good in the courtroom, he regularly turns on win lights in about eight seconds aboard his immaculate turbo-charged, car-tire Suzuki GS. Here Schwartz collects a winner’s check with crew chief Darin Duchek. 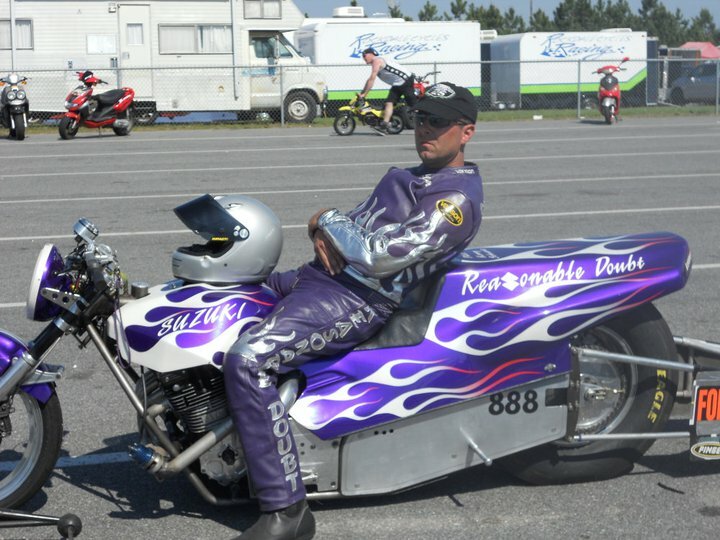 Not one to hide his profession of choice at the dragstrip, Schwartz named his impressive ride the “Reasonable Doubt Suzuki.” Over the years , Schwartz’s two loves, litigation and dragbike racing, have merged more than he ever imagined. Schwartz finds a lot of his motorcycle-riding colleagues tend to trust him more than just some random lawyer. Since he began racing in 1987, Schwartz has helped some very high-profile dragbike racers and organizations over the years. 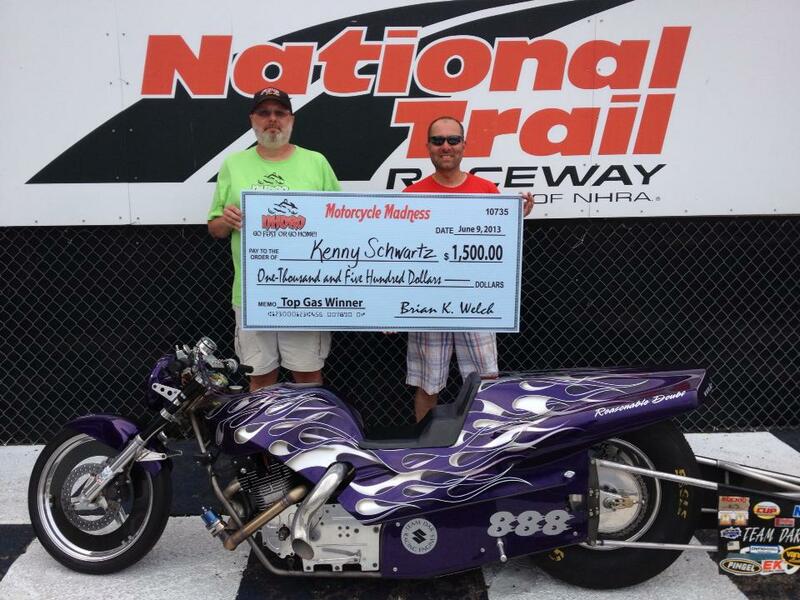 Ken Schwartz has helped some very high-profile dragbike racers like Larry “Spiderman” McBride and Jimmy “Hulk” Brantley. Schwartz worked closely with the defunct IDBA’s Leigh Ann Minn, doing whatever he could to help save the organization and he was instrumental in bringing AMA Prostar to his hometown for the PR Factory Store St. Louis Nationals. 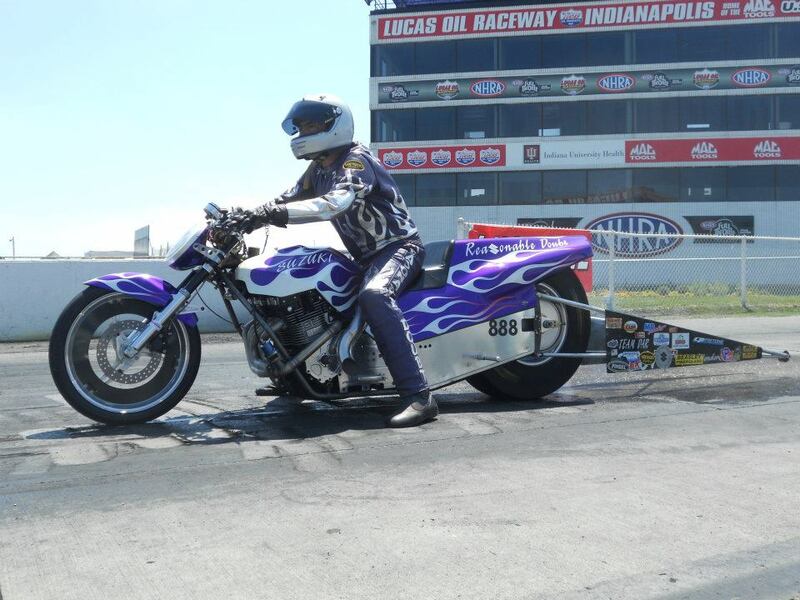 Schwartz, who has a NHDRO Top Gas championship to his credit, finds his high-speed experience is often helpful in the courtroom. Schwartz grew up riding motorcycles, including a 1970 Yamaha RD 350, and his love for dragbike racing began in the late 70s when he would watch legendary Funny Bike pilot Bryan Bennett record low-eight second elapsed times at Gateway International Raceway. Eventually Schwartz decided a piece of drag racing equipment of his own was necessary and purchased a 1984 GPZ 550 out of the crate. At this point Schwartz was hooked on motorcycle drag racing. However his two-wheel passion would have to wait as Schwartz, who would go on to become a Lieutenant in the U.S. Army, was about to be deployed to serve in Desert Storm. Upon returning home in 1992 and contemplating pursuing a career in law enforcement, Schwartz decided to follow in his father’s footsteps and enter law school. He also decided it was time to build his first real dragbike. “When I was deployed all the money I made was going back to my bank account and I never touched it. So when I came home I had about 10-thousand bucks. I promptly blew it all on building a Super Comp dragbike,” Schwartz said. Schwartz graduated law school in 1994 and five years later decided to assemble something really exotic. As a friend and admirer of the late, great Top Sportsman racer Roger Franke, Schwartz became fascinated with turbo bikes. The legal expert got himself a 2000 Koenig Pro Mod chassis, the predecessor to the Low Boy, very similar to the one Tommy Miceli famously rode to many event wins, and powered it with a 1,400 c.c. Suzuki GS motor with low compression pistons and stock 1150 cams. The bike featured a draw-through, carbureted fuel system, similar to how most Funny Bikes were setup at the time. Over the next decade, on this unique, and perhaps less than exemplary combination, Schwartz would go on to amass multiple top-five plates and numerous wins and final round appearances in IDBA and AMA Prostar. Schwartz’s contemporaries were thoroughly impressed. 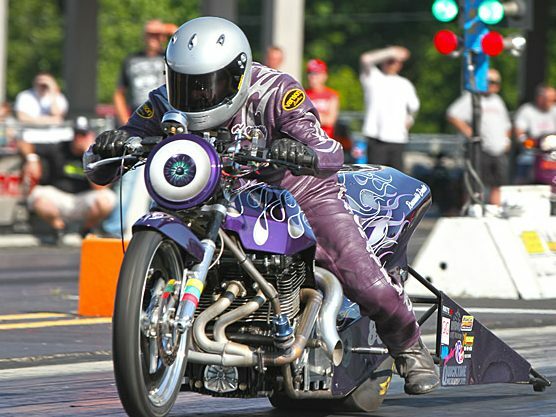 Ken Schwartz, who has a NHDRO Top Gas championship to his credit, finds his high-speed experience is often helpful in the courtroom. That’s not to say Schwartz has any plans of changing his beloved and enjoyable combination. It’s just too much fun for him. Schwartz continues to follow the NHDRO circuit and attending select PMRA racers, and a MANCUP race here or there, if his schedule permits. On this unique, and perhaps less than exemplary combination, Ken Schwartz would go on to amass multiple top-five plates and numerous wins and final round appearances in IDBA, AMA Prostar and NHDRO. 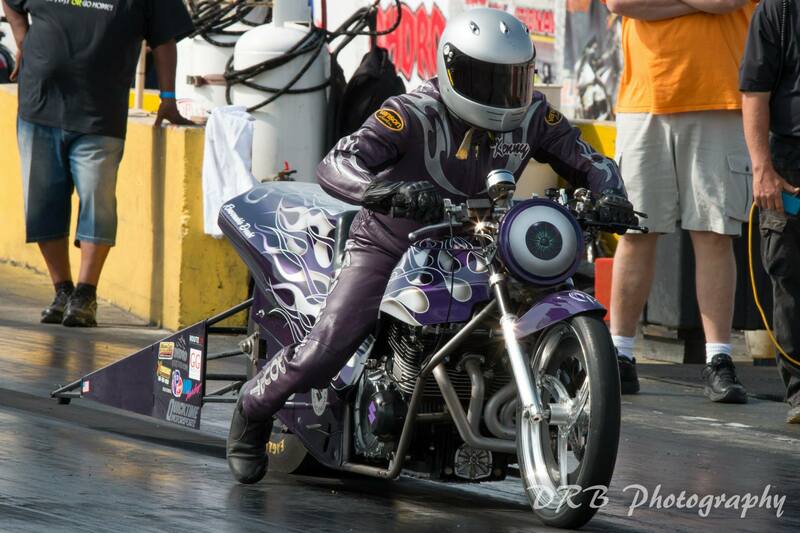 Give Schwartz a call and make sure to mention Cycledrag.com for all your legal needs – 314-863-4444.